In order to avoid future, catastrophic, climate change we need to urgently and significantly reduce our emissions of greenhouse gases. One of the ways to do this is to manage ecosystems and habitats that act as critical natural carbon sinks. to ensure that they retain as much of the carbon trapped in the system as possible and don’t tend to become sources to the atmosphere. The African continent has a large and growing role in the global carbon cycle, with potentially important climate change implications. 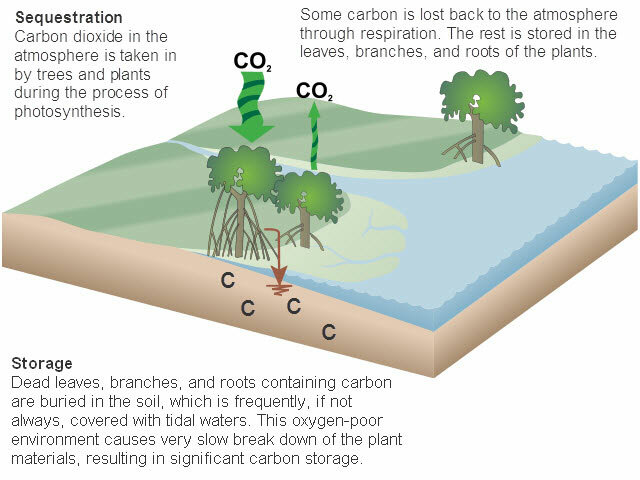 Carbon sequestration is defined as the process of removing and storing carbon from the atmosphere in carbon sinks (such as oceans, forests, grasslands or soils) through physical or biological processes, such as photosynthesis in plants. When the plants die and decompose, some of the carbon is transferred to soil. In the ocean, marine animals also take up the gas for photosynthesis, while some carbon dioxide dissolves in the seawater. Besides carbon sequestration, grasslands are important because they contribute to both mitigation of and adaptation to climate change e.g. prevention of floods etc, improvement of land and ecosystem health and resilience, biological diversity and water cycles while serving as a basis of agricultural productivity and economic growth (Food and Agriculture Organisation of the United Nations, 2010). ‘The ocean is the largest carbon sink on Earth.’ (Laffoley & Grimsditch, 2009) and oceans absorb more than a quarter of the carbon dioxide that humans put into the air. Besides their ability to sequestrate carbon, oceans are key ecosystems because of the significant goods and services they provide such as food security. For African countries with long coastlines and extensive coastal vegetation, coastal ecosystems are of high importance to the wellbeing of Africans because of the significant goods and services they provide as well as carbon management potential. Therefore, African countries need to reduce the sediment run-off from land; replant mangrove forests that have been displaced due to urban development and aquaculture; and stop over-fishing in their waters. Scientists are looking for ways to artificially sequester, or store, carbon dioxide underground. For carbon to be sequestered artificially (i.e. not using the natural processes of the carbon cycle) it must first be captured, or it must be significantly delayed or prevented from being re-released into the atmosphere (by combustion, decay, etc.) from an existing carbon-rich material, by being incorporated into an enduring usage (such as in construction). Thereafter it can be passively stored (usually buried) or remain productively utilized over time in a variety of ways. Examples of this include the capture of carbon dioxide from flue gases at power stations (in the case of coal, this coal pollution mitigation is sometimes known as “clean coal”). However, artificial sequestration is expensive, energy intensive and relatively untested – so we don’t necessarily know what the long-term effects will be of trying to artificially sequester carbon.